This Picture Frame Has A Polished Silver Finish And Comes Complete With Matboard And Mounting Hardware! This Picture Frame Is Just One Of The Swing Frame Products Available In Our Online Catalog! 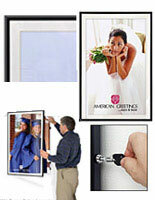 This high quality picture frame swings open on metal hinges to permit easy entrance to your print. 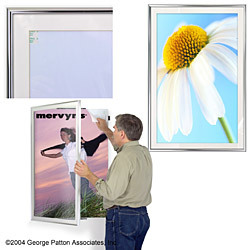 The 1/2" wide aluminum framing is finished in polished silver for outstanding looks, and the low profile design positions the front of the frame only 1.5" from the wall. The hinges are mounted to a sturdy wooden frame that mounts to the wall and supply a smooth long lived swinging action. 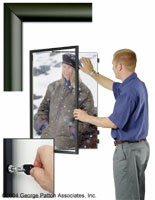 A concealed gravity latch ensures the frame remains closed and can effortlessly be opened with one hand. Attached to the inner frame is a duraplast backboard for mounting. 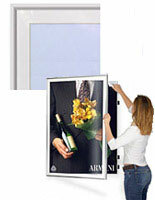 Removable/reusable mounting tape is provided and a clear acrylic lens protects your poster. Posters and artwork up to 3/16" thick will fit into this picture frame. 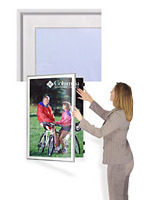 The white matboard border with a beveled edge will accentuate your poster against the frame.